The church was constructed in 1929 and is situated centrally in the recently formed parish of St. Leonard and St. Ethelburga. The building is traditional in design having elevations of brick and stone beneath a tiled roof. However, the interior of the roof was constructed to resemble that of a traditional Sussex Tithe Barn and this adds to the character of the building. Internally there is a spacious nave flanked by arched columns with aisles to both sides, a central chancel with choir stalls and organ leading to the main table and panelled reredos. There is a small area to the South side which has been enclosed using glass and can be accessed from either the chancel or the South aisle. This has been reordered to create a prayer space. The use of stained glass in the church is limited to the main window above the table and those in the chapel. There is a small clergy vestry, a youth room and a small lobby and toilet on the North side. 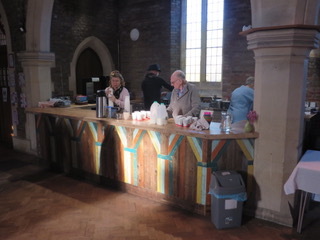 In 2017 a modern kitchen area was created at the rear of the church alongside a toilet with disabled access. In 2018 the heating system was upgraded and a new boiler installed so the church is warm in the winter months. 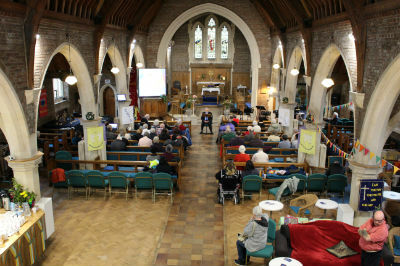 Since we have leased the church hall to a local business the church has doubled as a community meeting space. This has been helped by the removal of half of the pews to provide a larger, more flexible space. The music is provided by a music group and includes songs and hymns old and new. There are many opportunities on Sunday and during the week for activities for children from toddlers through to teenagers. The church is open for prayer on Friday mornings from 10.30am - 12 noon. A number of small study groups meet at various times of the week. There are a number of other activities during the week. Please contact the office for details.